Kinvara is situated in South Galway and is the gateway to the world-renowned Burren. Its name in Irish, Cinn Mhara, means 'head of the sea'. One of the more famous landmarks associated with Kinvara is Dunguaire Castle, built in the 1500's, is open to visitors in the summer months. Other features of interest include Kinvara Bay, which is part of a bird Sanctuary. Kinvara hosts two of the most enjoyable and successful festivals in the region. 'Crinni? 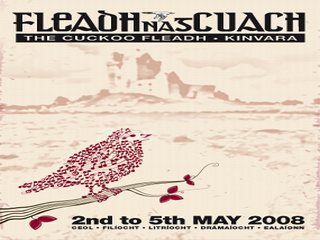 na mB?d' meaning Gathering of the Boats is a boating festival held in August, and Fleadh na gCuach, meaning Cuckoo Festival, is a traditional Irish Music festival held each April/May.